Bill Bramhall has been the staff editorial cartoonist at the New York Daily News for 13 years, his work appearing six days a week. 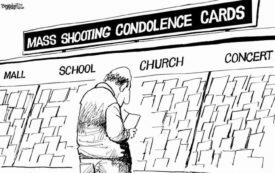 Government prayers won’t produce sane gun laws. Five artists’ responses.